For fans of the gluten-free savouries and cakes from Terra-The Earthfood Store, therea��s good news. The branda��s new flagship store in Neelangarai is ready for customers and stocks their entire range of goodies. Owned by Meera Maran, the enterprise began as a personal project, when she began experimenting with alternative flours and ingredients for her daughter who was allergic to gluten and lactose.The architect-turned-baker soon began retailing at about 30 stores across the city, but you had to get there early, thanks to the demand. 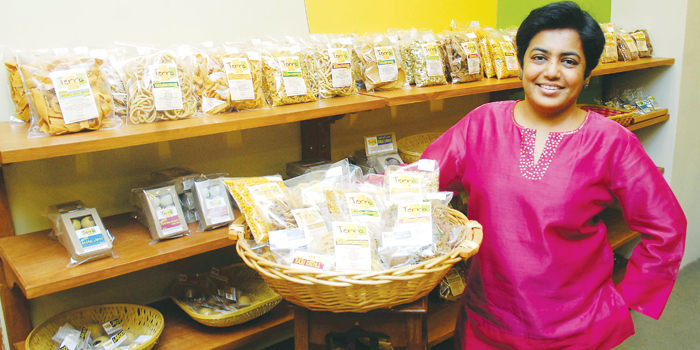 Her new store now features over 15 types of organic savouries (ragi-pepper thattai, red rice omum murukku etc), organic panankalkandu-based sweets (vegan kaju katli, thinai fig and honey ladoo), organic peanut varieties, their full range of gluten-free vegan cakes made primarily with organic brown rice a�� think apple-walnut cake, pomona and choco chip a�� and breads made from millet and brown rice. a�?Dhanyam, the organic store,is bringing in organic vegetables and groceries and complete the experience,a�? says Maran. While most of the products are made by The Terra Earthfood, the raw materials are sourced from organic farmersa�� co-operatives that specialise in millets, pulses and more. a�?I think mindful eating begins with conscious buying a�� to know the ingredients, and its origin would go a long way in fostering good choices,a�? she says. Marana��s products already have a market in Bangalore, Hyderabad, Mumbai, Pondicherry as well as Madurai, Coimbatore, Salem and Tirupur. Delhi and Kolkata are next. a�?We will introduce a new line of products aimed at simple meals made out of millets. We plan to increase our range of baked goods and introduce millet based pizzas,a�? she says.